How many angry letters and emails have I written in my lifetime? Volatile letters that brought powerful release for me, the writer, but perhaps churned up pain for their recipients? Poet | Yoga Teacher | Author of "Wanting It"
I found said note on my bedside table on a Sunday morning. It followed a power struggle about which pants to wear, given the chilly weather. My child had chosen a pair of white cotton capris, and I demanded she take them off and put on jeans. In hindsight, I realize I was being tyrannical and shouldn't have barked my bossy opinion. Let the girl get cold calves in the blustery wind. What she puts on her body is no longer my business, not the way it was when she was a baby and I could zip her warm 15-pound deliciousness into whatever little footed terry cloth suit I chose, then button her into a hand-knit, hooded wool sweater and snap on some fleece booties. Now she is 9 and dresses herself. She can multiply fractions and beat me in a full-out sprint. Becoming a mother means having your heart walk around outside your body. I read the note and felt a choking laugh get caught in my windpipe. I might have made a small sound. "Did you write this?" I asked my daughter, who, by then, was placidly folding laundry on the bedroom rug. She looked vague at first, then ashamed. "Yes." "Was it because of the pants?" I said. "Because I'm sorry I was so bossy. You can wear whatever pants you like." "Thanks," she said. Then: "I didn't mean it, Mommy. I'm really sorry." "It's OK. It's good to get your feelings out," I said, enfolding her slim body in a hug. I closed my eyes and breathed in the familiar musk of her hair, swallowing my shock at being the locus for her sudden hatred, remembering how my own mother served that role for me. Also remembering that my girl has a temper like mine, flaring up hot like a struck match before quickly subsiding. In the smoky aftermath, we both feel relief. How many angry letters and emails have I written in my lifetime? Volatile letters that brought powerful release for me, the writer, but perhaps churned up pain for their recipients? I'm proud that my child can express herself through language, glad that she feels safe enough at home to vent her emotions. One sign of strong attachment, a friend later tells me, is negative expression. But I couldn't stand there mutely amidst the piles of laundry and breathe peace and acceptance. 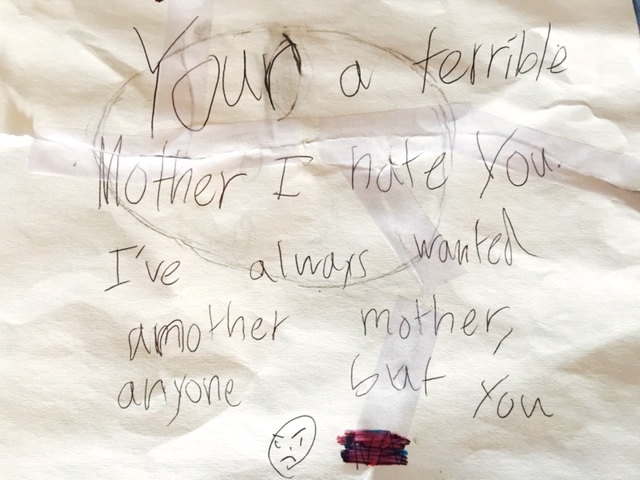 The risk of giving a note like this to your mother the writer is that anything you say and do can be used as material. "Still, this is a pretty strong note," I said. "I might have to write about it." Eventually, we all dispersed into our Sunday projects. The letter-writer spent the next few hours whittling out in Sumac City, making a small, sharp dagger out of a piece of Maple. I taped the original fragments together and snapped the above photo of the evidence, ruminating on the charged bond between mothers and daughters. My husband, I knew, would never receive a message like this one. she has been a prisoner since she has been a daughter. -Louise Gluck, "Persephone the Wanderer"
I remember feeling imprisoned even (or especially) in the warm omnipresence of my loving mother. How quickly hate flared out of the experience of love. How I still feel trapped sometimes in my relationship with my mom. The problem now is not my daughter lashing out at me (as she will again), but my own shocked response. Being occasionally hated is part of the job description. I need to get some perspective -- have a beer or read a book or hang out with a friend. Motherhood is no longer viewed as simply a relationship with your children, a role you play at home and at school, or even a hallowed institution. Motherhood has been elevated -- or perhaps demoted -- to the realm of lifestyle, an all-encompassing identity with demands and expectations that eclipse everything else in a woman's life. This insight rings absolutely true, for me and for my peers. Twenty-first century motherhood is all-encompassing. We mothers are invested in our identities in ways that even the most devoted fathers are not. This is one more reason my child's hate mail stings. And why I think I have the right to blog about it. *My daughter has since relented and permitted me to post the note. via "Mom Candy: 1,000 Quotes of Inspiration for Mothers"